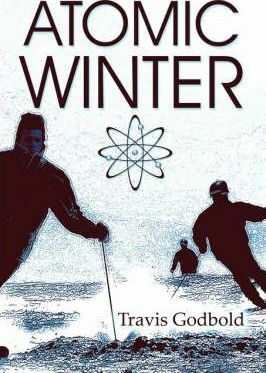 Atomic Winter, by Travis Godbold is a concise, fast-paced little thriller with surreal overtones. Set largely in Norway in January of 1943, Atomic Winter has all the action you might expect from a WWII action thriller, but also has a supernatural flavor served up by the character of the wonderfully weird Lapp shaman who seems to be a perfect manifestation of the forbidding and spookily beautiful Norwegian winter landscape, ornamented with dazzling sunsets and shaggy pines. Caught between duplicitous allies and evil Nazis, alcoholic American skier Samuel and Norwegian ski bum Erik become inadvertently entangled in a plot to steal vital papers on a horrifying secret weapon from a Nazi outpost. After making a clumsy attempt to steal the papers from the Nazis, Samuel and Eric are captured after discovering that the papers have already been stolen by someone else. Shortly afterward, they are rescued by a strange blue-faced Lapp shaman that Samuel nicknames the ablue devil, a and a stampede of graceful yet murderous reindeer. After they escape, the ablue devila hides Samuel and Erik with his wandering Lapps, the people he calls the Sami. During their flight from the Nazis and time spent with the Lapps, Samuel discovers that the Shaman has the secret papers stolen from the Nazisaand conspires with Erik to steal them from his mysterious host and return them to the allied forces in exchange for a rich reward. The subsequent action, which encompasses a colorful mix of winter warfare and weird, semi-magical events is fast, fun and furious. In less than a hundred pages, Godbold creates a terrific action thriller with haunting overtones and magical highlights in a breathtaking setting that includes many fantastic ski chases in the Norway snows. This will be a perfect book to read on a winter evening by a roaring fire. If you stick close by the fire, maybe the blue devil wonat get you!